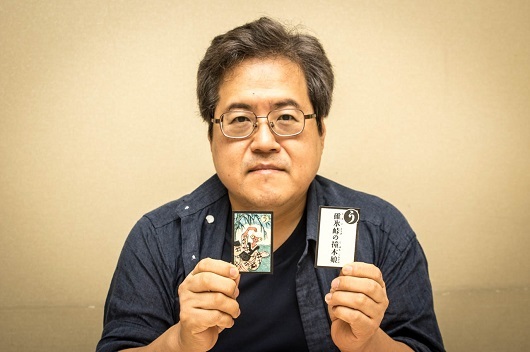 While his calling card says that Tada Katsumi is a specialist in yokai --the monsters, specters, and other creatures of imagination that populate Japanese lore--he nevertheless says he does not study the yōkai themselves. We asked him to explain what it is that he does study and what its fascination is for him. My interest in yōkai goes back to the yōkai feature issues published by Shonen magajin when I was small. I had been reading the manga magazine since around time I was in kindergarten. The issues had not only yokai but also ghosts and horrible depictions of hell. It was not a matter of whether I liked them or not--they just grabbed me--mesmerized me. We don't even see really scary pictures like those these days. 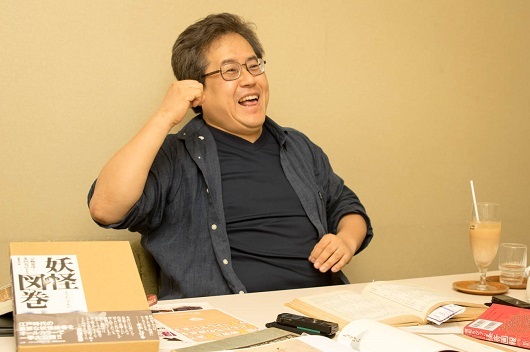 Hatsumi Ken'ichi. Shōwa chibikko kaiki gahō [Shōwa Children's Illustrations of the Strange and Bizarre]. Seigensha, 2014. It is a collection of manga carried in the yokai feature issues of Shonen magajin Tada read when he was small. Eventually I began to think about the line between life and death, and between what is good and what is bad. I learned how to make judgments and control my own behavior. I also came to understand that if I wanted to go to heaven, for example, I should not kill other living beings. In short I acquired moral judgment. I had always loved any sort of living creature and had often collected insects, but around the time I was in third grade I quit, thinking that it wasn't good to take insects' lives just for the sake of my curiosity. Later I started visiting a museum to pursue my fascination with the primitive form of life known as "slime mold" and I made about 300 specimens of pressed flowers. In fourth grade I was reading the magazine Kisho [Weather], which used to be put out by the Japan Meterological Agency every month. I bought every issue until it ceased publication in 2009. I was interested in all kinds of things besides monsters. After graduating from high school, I went to art school and became a graphic designer. On the side, I was studying the Engishiki (Procedures of the Engi Era), a compilation of laws and customs completed in 927 and got interested in establishing when the shikinaisha* shrine system had been adopted. I knew that there was some kind of relationship between the shikinaisha shrines and the keyhole-shaped tumuli of the Tumulus Period (3rd to 7th centuries) but there were no documents from that period. I really wanted to go and study the leading clans of the pertinent regions, but I held a salaried job and could not obtain the needed time. I finally decided to quit my company job. 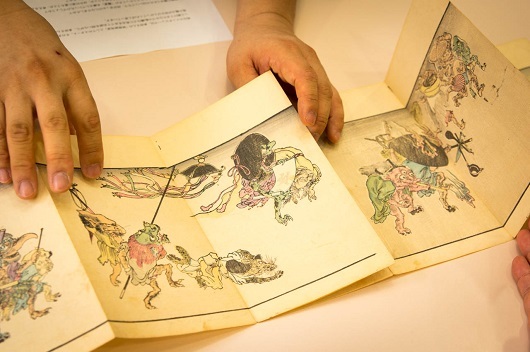 Just about that time, I happened to hear that a valuable book of depictions of the hyakki yagyo--the "night parade of one hundred demons"--was being sold in a second-hand bookstore. I thought to myself that if I could buy it I could devote myself to yōkai research and make it a success. So I resolved that I would get hold of it by all means, and after negotiating with the bookseller, I got it! It was ¥200,000 at the time. These days, books about yokai are so popular, I'm sure the price for such a work would be much higher and probably wouldn't be on sale in a bookshop. *Shikinaisha were the "official shrines" listed in the Engishiki. Some 2,900 shrines are mentioned in total. The illustration of the hyakki yagyo obtained when Tada was 29. After quitting my salaryworker job, I spent about 10 months reading about yokai--I read about 200 books and collections of yōkai stories. And then I wrote Genso sekai no junin-tachi [Dwellers of the Realm of the Imaginary] aiming to cover the yōkai of Japan from the ancient through Meiji era, and that led me in the direction of the research I would pursue after that. Yokai research is not the study of the yokai themselves, it has to be focused on the world created by the notion of yokai. So what are yokai? 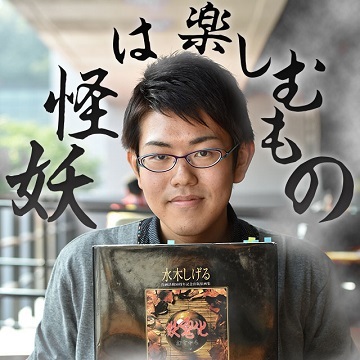 In olden times when something threatening or fearsome happened and the reason was not understood--things like colds or epidemics--people would say it was caused by oni (goblins or demons, which are among yokai). People would say that the oni were walking in their midst, scattering germs from bags they carried. Earthquakes and tsunami were the work of yokai, and when there was political upheaval or turmoil it was said to happen because the yokai were mingling in human society. After all, in those days, people had no way of knowing why such problems came about. In other words, the yokai were beings that were responsible for bad things happening to humans. Beings that were useful to people might be venerated as divine beings--they were called kami. 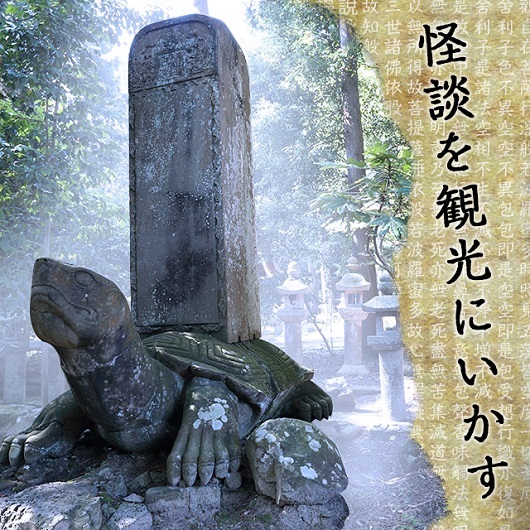 There were yokai that were good-spirited, and they played roles useful to humankind, such as by driving away demons; there are even shrines dedicated to such yokai. Sankichi-oni, for example, is a sake-loving demon who, when presented with sake, chops wood for people and helps them out with all sorts of work. That makes an oni that is pretty close to a kami. In this way, kami and yokai were not clearly separated; in some cases they overlapped. With advancements in science, some of the doings of the yokai began to be explained in scientific terms. One good example are the mysterious lights seen in Yatsushiro, Kumamoto prefecture. Even on moonless nights, when the tide has gone completely down, 100 or 200 lights can be seen on the shore. Thenm, when one approaches, the lights seem to withdraw into the distance. Many attempts have been made to explain this phenomenon, and science professor Miyanishi Michika (1892-1962) has advanced the theory that these are a kind of mirage. Physicist Terada Torahiko (1878-1935) also believed that many yōkai could be explained in terms of natural phenomena. 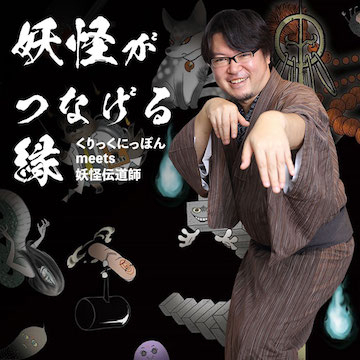 Connected with the yokai in amoeba-like fashion are natural phenomena, living things, legends, superstitions, customs, old lifestyles, foods, drink, all manner of deities, and so on. So attempting to narrow down research to just the yokai themselves doesn't go very deep. We only begin to get an idea of what the yokai are by looking at the things around them out of which they emerged. I think we get greater insight on society and people at the same time. Kyogoku Natsuhiko and Tada Katsumi, Yokai zukan [Yokai Illustrated]. Kokusho Kankokai, 2000. Among the yokai of Japan are many believed to be based on the strange phenomena that appear in Chinese stories of the strange and bizarre. 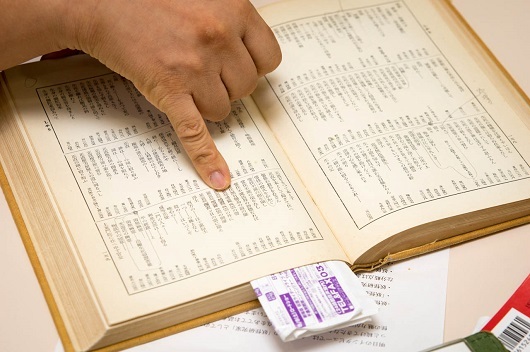 Chinese books were actively read during Japan's Edo period (1603-1867) and Chinese ghost stories were one of the ways people enjoyed learning classical Chinese, which was called kanbun and read by annotating it to be read in Japanese. A popular form of entertainment in the Edo period was the "hyaku monogatari" (100 tales), when people would gather together, light 100 candles to create the right ambience, and then tell ghost stories. After each story was told, one of the candles would be blown out, and with the 100th--when the 100th candle was blown out--a real specter would appear. These sessions were held widely and new stories were always in great demand, so many ghost stories from China were introduced. Today in China, not many of those old ghost stories have been handed down. In Japan, the reason that many yokai remain part of popular culture is that they were converted into popularly recognized characters familiar to ordinary people. During the Edo period, the Ehon hyaku monogatari [Picture Book of a Hundred Stories], richly illustrated with pictures of yokai, was published in 1841. Famous manga artist Mizuki Shigeru (1922-2015) studied the illustrations in that book and through his wonderful "Gegege no Kitarō" series created characters now familiar to millions like Nurikabe (the sleepy eyed, wall-shaped yokai) and Ittan Momen (a flying yokai looking like a strip of white cloth). Gegege no Kitaro has been made into an animation television series and Kitaro, the hero of the series, appears over and over in movies like Yokai daisensō [The Great Yōkai War]. The continuing development of the yokai as characters, however, tends to obscure the original forms and phenomena upon which they were based. For example, "Azukiarai" is a yokai that brings to mind for many people the image of an aging goblin washing adzuki beans in a stream and and the rustling sound of the beans being rinsed in a basket. In fact, however, the sound can probably be traced to the rustling of lice that propagate by the thousands by feeding off mildew that forms in bedding or matting. If you have ever heard the sha-sha-sha sound made when whipping a bowl of green matcha tea with a bamboo whisk, it's rather like that. When we consider that people imagined yokai without ever actually seen their shape or form, it is likely that the Azukiarai yokai was originally the mites' munching sound itself. 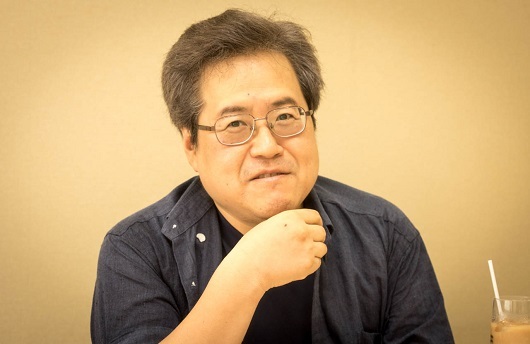 Setting aside whether the characterization of yokai is good or bad, it is also necessary for yokai research to deal with how and what changes took place in how they were seen. 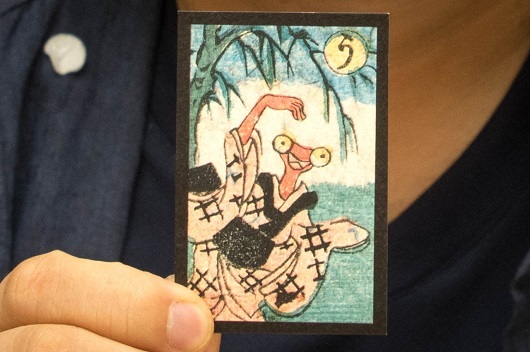 Holding one of my favorite pairs from a set of game cards that was popular during the Edo period. The Tosho Kankō Kai published a reprint edition of these cards in 1998. The topic of my current research is noh. Specters and ghosts (yokai) are frequent characters in noh plays--among the best known are the ground spider (tsuchigumo) and the nue. The dramatization, lighting, and other effects used on the noh stage add to their portrayal, and once a yokai in noh becomes famous, the original legends surrounding it can become totally changed. I have found that the stories surrounding yokai have changed completely between now and five hundred years ago. What I'm trying to find out now is how and when those changes came about. This is the table of contents of a book of noh plays. I have marked the plays that relate to yokai. Sanari Kentarō, Yokyoku taikan [Compendium of Noh Plays]. Meiji Shoin, 1931. Before I started studying noh, I was doing research on Toriyama Sekien (1712-1788), who drew original pictures of yokai in the early Edo period. The yokai General Seto he drew is related to Cao Cao and Guan Yu, generals of the Romance of the Three Kingdoms (Jp. Sangokushi), and 10 years went by while I was studying Three Kingdoms. 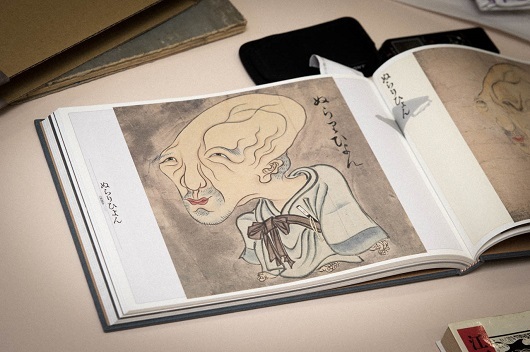 That's about how absorbed one can get in the process of delving into the world of the yokai. What is so interesting about yokai research are the insights it affords on worlds about which I knew nothing before--the world of noh, painting and art, and so on. 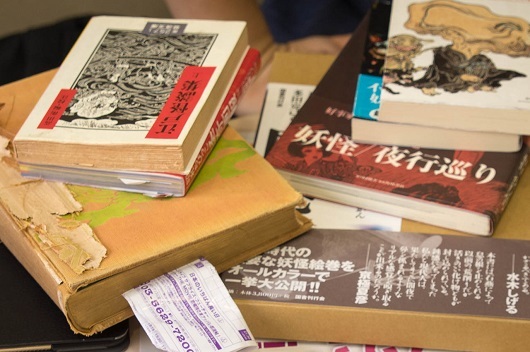 Yokai studies links up with a whole array of different fields--it's kind of endless. For me, yokai is like a hub for exploring many branches of knowledge. I've found that studying yokai leads to learning more about humans themselves and about their world, or in other words, to learning more about myself.